From the ESP Web Homepage, all of the features and functions of ESP are at your fingertips! The main tabs at the top enable you to navigate between the available applications on the ESP Platform. Access the tools you need to grow your promotional products business, manage your day-to-day operations and succeed within this lucrative industry! Websites Admin is where you can manage your customized company website that auto-populates with ESP product listings. Customer Relationship Management (CRM) enables you to track notes and reminders about your customers and their order history and generate business documents all in one place. ESP Orders contains all orders, invoices and quotes and in one convenient location right in ESP. Email Marketing is where you can create, send and track email marketing ads through ESP to reach your target audience and sell more. What are the four icons? Question Mark: This is the help icon and will bring you into the ASI Knowledge Base. You can also access helpful articles by clicking on the green Help & Support tab next to the scroll bar. Bell: This is the notifications icon and will alert you to any notifications, such as tasks or shared order documentation. Clipboard: The Clipboard is a handy tool which enables you to hold up to 250 products for 90 days. 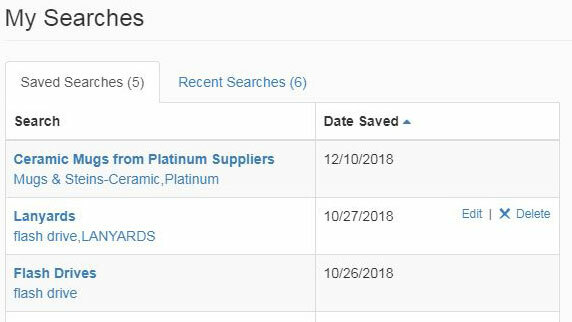 For more information on the Clipboard and how to use it, please review the Clipboard section of the Manage Product Results article. Avatar: The avatar is a profile image for ESP. This area is also where you can manage your account and application information, settings, and preferences. These options enable you to access the Quick Search. Selecting "Find a Supplier" or "Find a Decorator" will toggle the Quick Search from a product search to a supplier or decorator search, respectively. 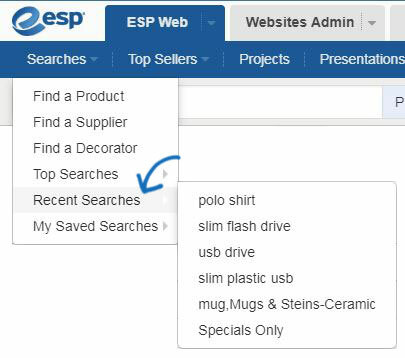 Check out the Searching in ESP Web article for more information on how to locate products, suppliers, and decorators, as well as how to search using images. Top Searches are the most commonly searched 20 keywords or phrases, based on user research. Click on Searches from the ESP toolbar and then hover on Top Searches. Click on the name of the search to view the products within. 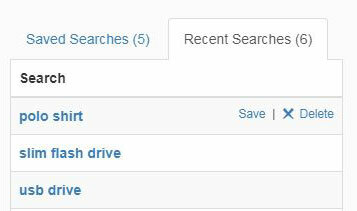 Recent Searches is where your most recent product searches will be stored. Hover on Recent Searches to view the searches and click on a search listing to view product results. To save or delete recent searches, click on Recent Searches in the Searches dropdown. Then, hover on the listing for the search you would like to Save or Delete and use the corresponding option. My Saved Searches is where you are able to save a search. Aftering saving a search, you can hover on My Saved Searches to view all available searches or click on My Saved Searches to manage your saved searches. Each saved search listing will be available in this section until or unless you delete it. Saved searches can be edited or deleted. To edit or delete a saved search, hover on the listing for the search you would like to Edit or Delete and use the corresponding option. Top Sellers provides you with access to a supplier for a specific category of products. There are two ways to access the Top Sellers in ESP Web. On the main toolbar, click on the Top Sellers option. The Top Sellers are also available directly on the ESP Web homepage. Hover on a category on the ESP homepage to view subcategories and click on the subcategory to view the products within. The Projects area is where you store customer folders, presentations and products. Click on Projects from the ESP Web toolbar. Please review the Projects in ESP Web article for more information on using Projects. Presentations Manager: Access your five most recent projects and presentations. Create New Presentation: Begin a new presentation. Recent Presentations: Hover on this option to view your most recently created or edited presentations. Click on a presentation to open it in the presentation editor. Please review the Creating and Editing Presentations in ESP Web article for more information on using ESP Presentations. The New Suppliers option will display newly listed suppliers. On each listing, you will be able to view the supplier's contact information, as well as the date they were listed and a link to their products in ESP. Within ESP Web, full length catalogs are available for viewing using the Supplier Catalogs option and pages are optimized so you can order products directly from the catalog! Please review the Supplier Catalogs in ESP Web article for more information on using Supplier Catalogs. Looking for free shipping or EQP? ESP makes it easier than ever with the new Supplier Specials feature! Please review the Supplier Specials on ESP Web article for more information on Supplier Specials. Below the navigation, there is the Quick Search, which enables you to locate information using a variety of search options.The Quick Search can be used to locate product, supplier, and/or decorator information. 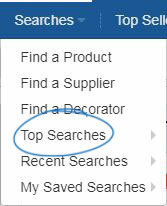 The dropdown enables you to toggle between the different searches and defaults to product search. You can also use the Open Advanced Search link to use more detailed information in your search query. 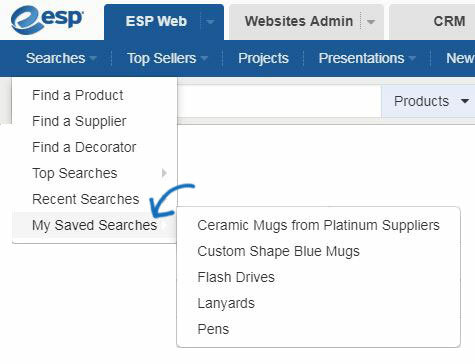 Check out the Searching in ESP Web article for more information on how to locate products, suppliers, and decorators, as well as how to search using images. Also on the ESP Web Homepage is the Product of the Day, which is an item provided by an ASI Supplier, as well as some ASI Supplier featured specials which appear on a rotating banner. The Recommended for You section provides quick access to products which have similar attributes to your most recent search. The Top Sellers section provides you with access to a specific category of products from a featured supplier. At the bottom of the page are links to ASI Technical Product Support, the ASI Store, the ASI Community, and our Company.